In the applet below, each of the parallel lines can be dragged up or down. There are three draggable points, one per line. The question is to position them so as to get an equilateral triangle. The problem illustrates an application of the Rotation Transform. Let L be the line that bears point C, and similarly L1 and L2. 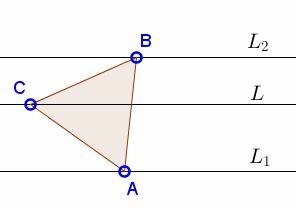 Assume ΔABC is equilateral, with A on L1 and B on L2. Rotation through 60° around C maps A on B. (The rotation may be either clockwise or counterclockwise depending on the orientation of ΔABC. Generally speaking the problem admits two solutions differently oriented.) Let's perform such a rotation: rotate line L1 through 60° into position L'. The image of A under that rotation lies on L' but also coincides with B. It follows that B is the intersection of L' with L2 and A the corresponding point on L1. This leads to the following construction: rotate L1 around C though 60° into position L'. Denote B the intersection of L' and L2 and A the inverse rotation of B. Then ΔABC is equilateral,scalene,right,equilateral,obtuse. For proof, observe that by the construction CA = CB and ∠ACB = 60°.